These are sometimes called Green Worms. These terrestrial (Terrestrial: Insects which live on land and are fed on by trout only when they incidentally fall into the water are known as "terrestrials" to fly anglers, and they're very important in late summer.) 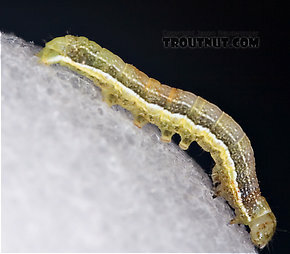 moths are sometimes taken by trout when their larvae, the well-known inchworms, dangle by their little silken threads in especially high numbers around June. They may be abundant enough throughout the forest that plenty dangle their way into the water.